Roquefort has a special place in France and although it is most often served on a cheese platter, did you know it can also be used in appetizers? A simple appetizer made with this traditional French cheese is the ham and Roquefort roulade appetizer (roulés de jambon au Roquefort). We’ve used this quick recipe for years on both sides of the Atlantic — easy to make and always a big hit. I fondly remember being responsible the Roquefort roulade appetizer for the “apéro” growing up – a very serious job! Each roulade was carefully prepared and sliced before being offered to each guest with much pride and joy. And why is it called a “roulade”? Nothing to do with any fancy culinary technique. It is simply derived from the verb “rouler” in French which means “to roll”. Since you are “rolling” the ham, this becomes a “roulade” — c’est tout (that’s all)! Now remember that Roquefort is a cheese with a strong and pronounced flavor but even so, the recipe calls for creaming your Roquefort with butter (what else for a French appetizer!) so this roulade appetizer may be enjoyed even by guests that find Roquefort a bit too strong. 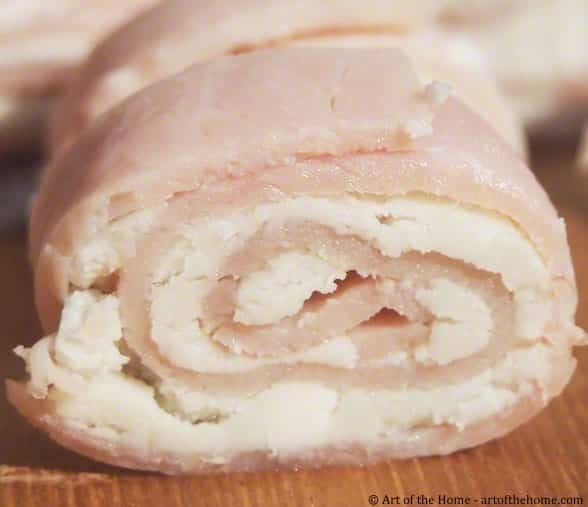 Keep in mind that this ham and Roquefort roulade appetizer needs to be refrigerated overnight (or at least 8 hours) so it does need to be made ahead of time. Some planning will be required but then you will have more free time on the day of your dinner party to enjoy your company or simply relax – love that! 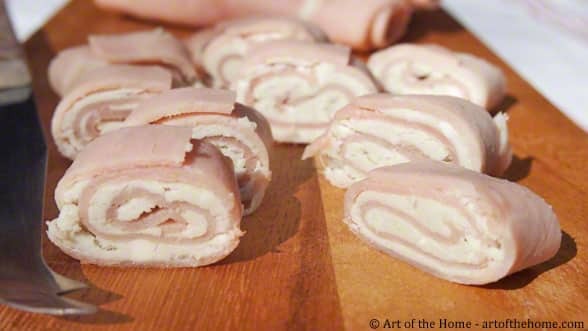 So check out the easy Art of the Home ham and Roquefort roulade appetizer recipe and Art of the Home suggestions below. Enjoy and bon appétit! Cream softened butter and Roquefort with a fork to give it a paste like texture – leaving tiny bits of Roquefort is fine, in fact we prefer it that way. Dry ham with paper towel and place on a cookie sheet lined with aluminum foil (for easy clean up). 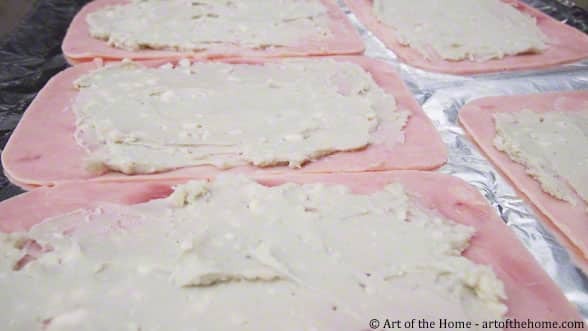 Spread Roquefort-butter mixture evenly on your 6 slices of ham. Roll and wrap tightly in a plastic film. Note of French ham: when we can, we use French ham. In the US, we suggest the Madrange ham or the French ham in the deli section at Whole Foods. French ham is less moist and has a more meaty texture to it but it is a personal taste issue, you can use whatever ham you like as long as you make sure you pad it very dry. Refrigerate overnight (or at least 8 hours). Before serving, take out of the fridge and make thick rounds with a chef knife (quick and sharp cut to keep the shape of the roulade). Add a colored toothpick on top for a more festive touch. If the Roquefort taste is still a bit too strong, add more softened butter. To the contrary, decrease the quantity of butter if you like a super strong Roquefort flavor.